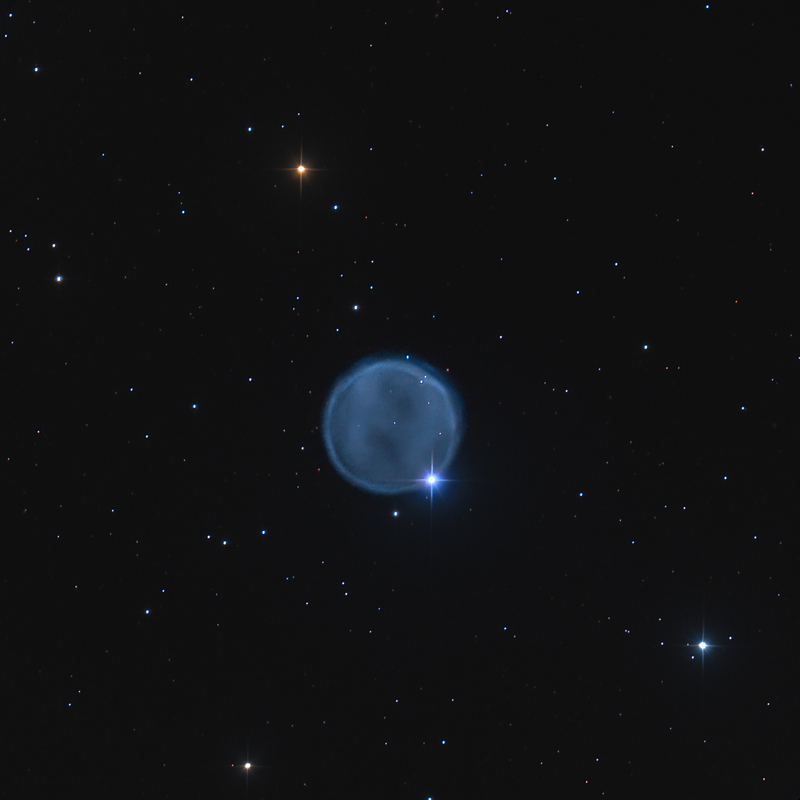 Abell 33 is a spherical planetary nebula in the southern constellation of Hydra about 2,700 light years distant.� It has been described as a diamond ring due to the bright star (HD83535) at its rim.� This star is not part of the nebula, being in front of it in our line of sight. The inner structure has similar dark and light features as the northern Owl planetary nebula, M97.� The outer envelope is a distinct rim.� The primary color is due to strong emission of oxygen (OIII).� The hydrogen (H-a)�signal is much weaker. The image above is 25 x 25 arcminutes and Abell 33 is about 4.5′ in diameter.� Nebular structure is defined by narrowband filters where OIII was color-mapped to blue-green and H-a to red/magenta. Star colors were produced by RGB filters.� North is up and east is to the left. Wow OIII really shows the outer rim much more clearly than in LRGB. Also the central star is a visually split binary!